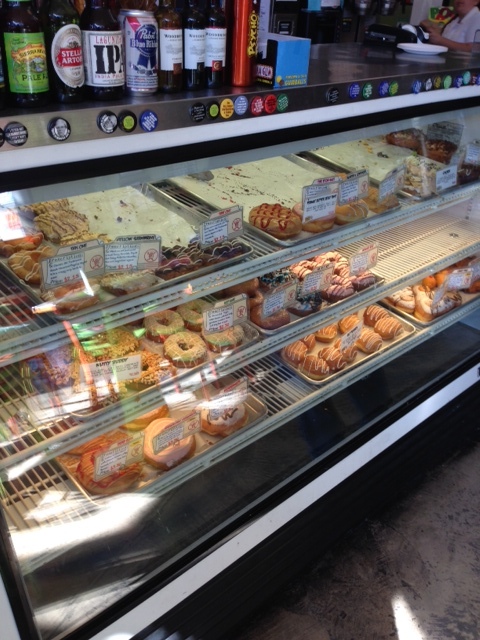 Veteran donut eaters may find that the selection in chain bakeries tends towards standard, even boring at times. And while those who tend towards chocolate or plain jelly donuts will find satisfcation at traditional establishment, crazier donut aficionados desire a little more excitement in their pastry. For those people, Psycho Donuts–featuring a wacky B-movie theme both in its atmosphere and in its donut selection–is there to fit the bill. Key Lime: The first donut I had here, the vegan Key Lime, combines a tangy flavor with a satisfying solidity. It is so dense and chewy, it’s almost a scone. Strawberry Fields: A square donut topped with strawbery icing, freeze-dried strawberries, and with a single stick of strawberry Pocky laid across the hole. Cereal Killer: Marshmallow frosting (not “marshmallow-flavored” frosting–actual marshmallow frosting) covered with Cap’n Crunch. Extremely sweet, but the range of textures stops the flavor from being overpowering. This One/That One: Named after the chef’s frustration at customers not ordering donuts by name, these simple old-fashioned vanilla and chocolate donuts, respectively, are some of the best in the store, showing that Psycho Donuts knows how to do the basics as much as it knows how to show off. Psycho Donuts also does dozens of seasonal promotions, with some donuts only available for a few days. My personal favorite is only available in the San Jose store on Memorial Day Weekend as part of a cross-promotion with local anime convention FanimeCon: The Psycho Takoyaki is eight ginger-flavored donut holes topped with caramel, lemongrass bavarian, coconut, and toasted pistachio. Psycho Donuts’ unique selection and rotating menu makes it a great place to go to again and again. Donuts are baked in batches of four to six flavors at a time, meaning that what you want may not always be available in the case, but there is usually enough of a selection to make you indecisive. The San Jose venue also contains a movie theater and the popular improv team ComedySportz–why not make it an evening?